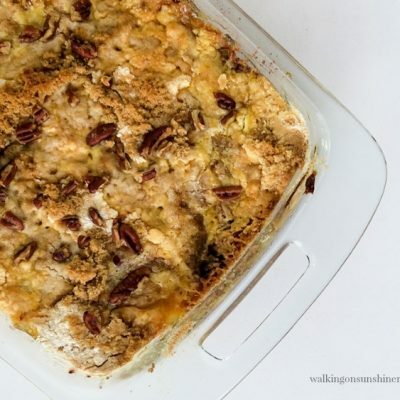 Apple Dump Cake is an easy and delicious recipe to make to help celebrate Fall! Don’t forget a scoop of vanilla ice cream on top! Do you need an EASY recipe when you’re entertaining? 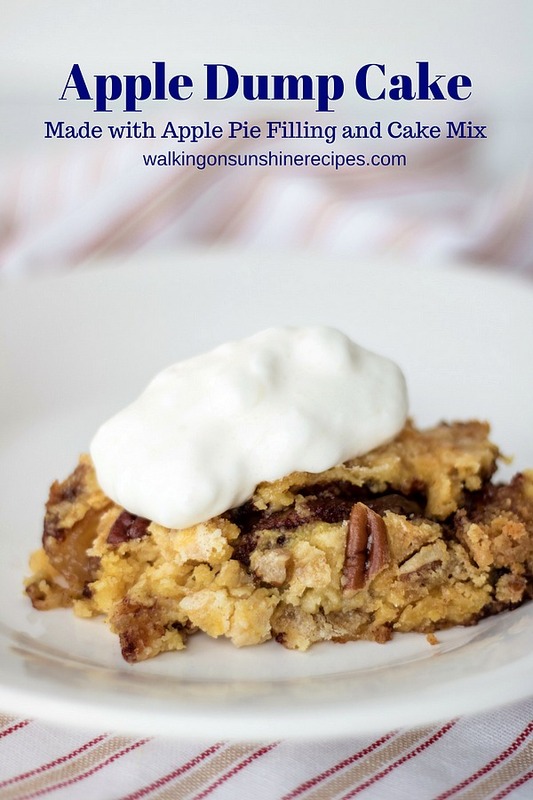 Then you are going to want to check out this easy recipe for Apple Dump Cake. 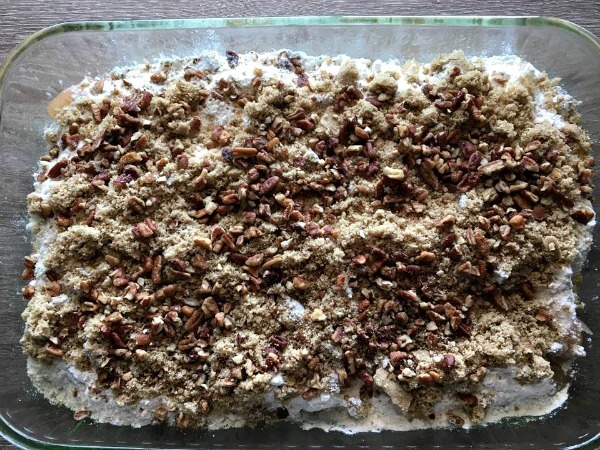 The recipe is just like the recipe says, it’s a dump cake recipe meaning you literally dump everything into a baking dish and bake! How easy is that? 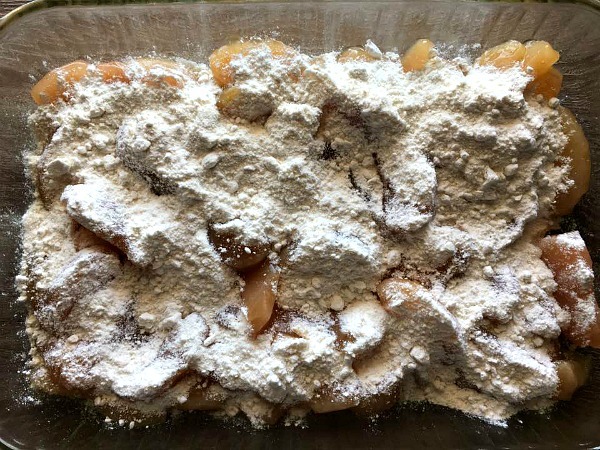 I made this Apple Dump Cake this weekend when we hosted 18 people at our house after our annual Fall Church Cleanup. My husband was in charge and he invited everyone over to our house for lunch. I needed an easy recipe to make because of my work schedule. I immediately thought of the very popular Peach Crunch Cake recipe that’s been on the blog forever, but I knew I wanted to celebrate fall. 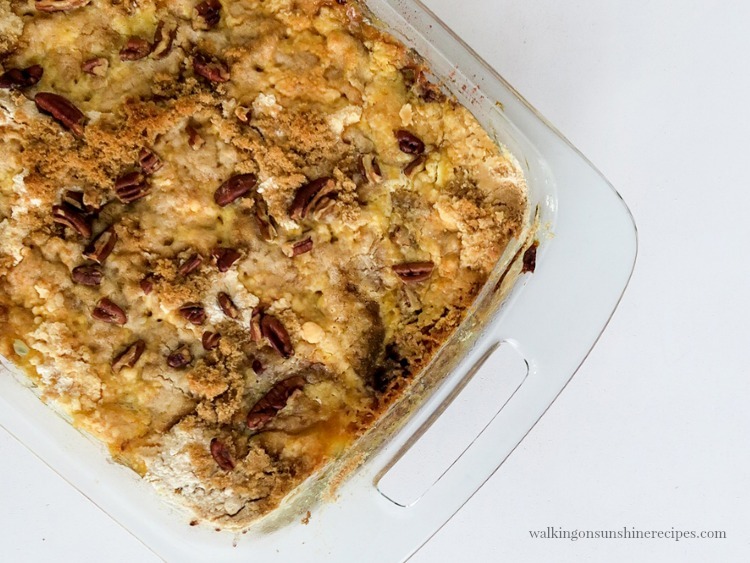 What better way to celebrate Fall than with apples! 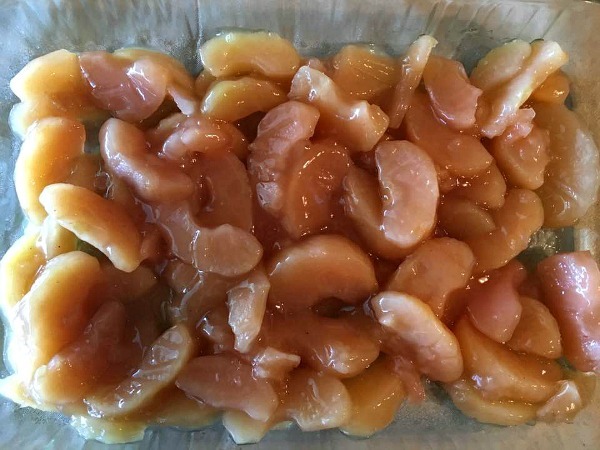 So I swapped out the peaches for apples and it was so easy and delicious, I know you’re going to love it as much as we did. In a 9X11 baking dish, that has been sprayed with non-stick cooking spray, add the two cans of apple pie filling. Add the brown sugar to the top. Add the chopped pecans to the top. Add the sliced butter to the top. Bake for 20 to 30 minutes or until the edges are hot and bubbly. Let’s Get Started Making this Delicious Recipe! 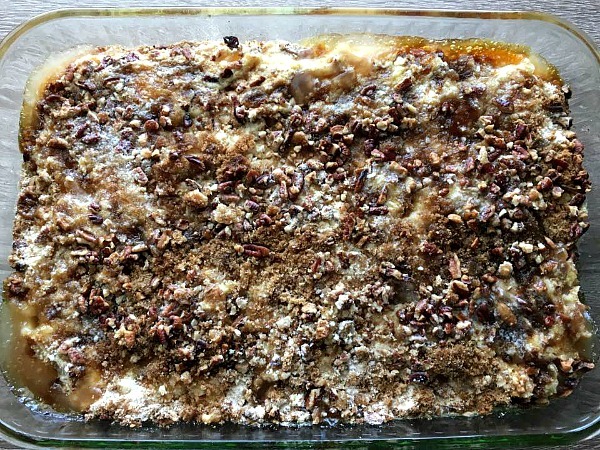 In a 9X11 baking dish, layer two cans of apple pie filling and stir in the cinnamon. Trust me, okay? Now open the bag of yellow cake mix and sprinkle on top of the apples. Next add the brown sugar and chopped pecans. 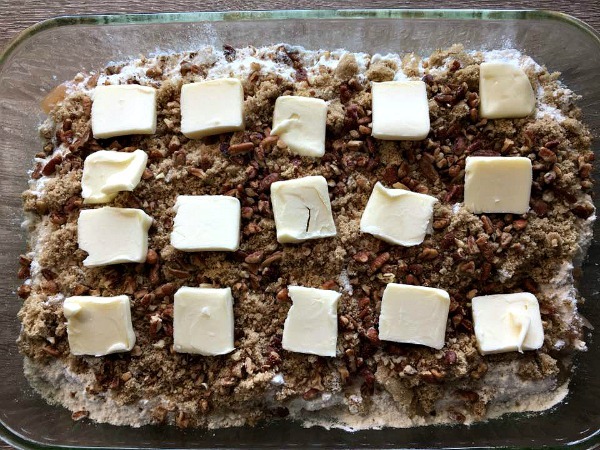 Topping with the butter helps to make the crumble topping even more delicious. Bake in a 350 degree oven for 20 to 30 minutes or until the top is nicely browned and the cake is bubbling. 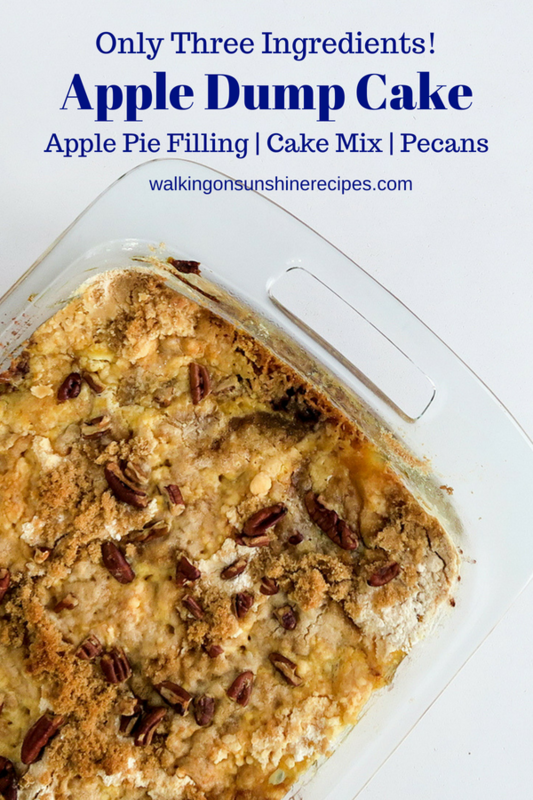 This easy recipe is delicious warm from the oven but you may want it to cool down just a bit so you can add a scoop of vanilla ice cream or freshly made whipped cream. 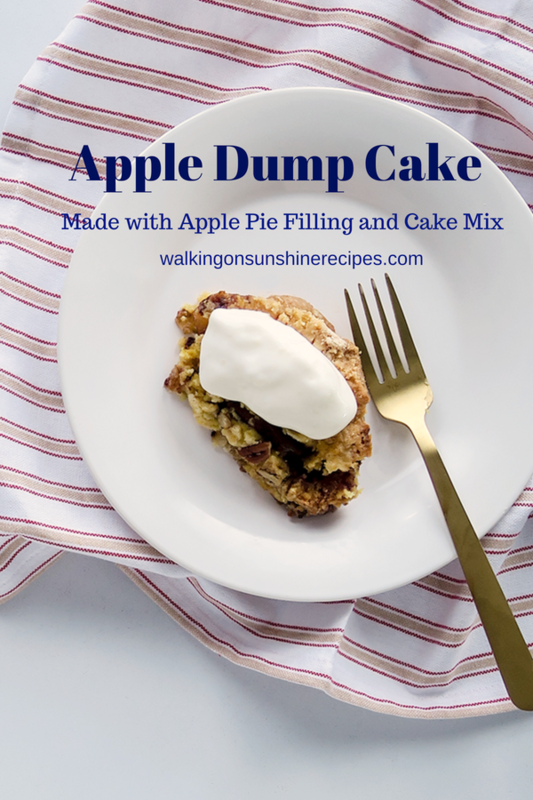 Celebrate Fall with this easy and delicious dump cake recipe. Make sure you add fresh whipped cream or vanilla ice cream on top! This is my new favorite way to eat apples. This cake looks so delicious. I have never made this with fresh apples, so I wouldn’t be able to give you instructions. Thank you for visiting! Lois, This cake looks so easy and quick, my kind of baking! You’re one of my features tonight at SYS! Please come back and join our party again! Thank you for visiting and for featuring my recipe! This was a delicious recipe. The only thing is the cook time was 45 minutes not 20 or 30.